Pelaio-Etxea is a recently renovated family apartment, faithfully following the local fishermen’s house style. It is situated in the historic centre of the village, between Elkano Street and San Roke Street, on the second floor of the building, which has a lift for easy access. The apartment offers accommodation for 4 people (with the possibility to extend to 5), has a dining kitchen, living room and two twin bedrooms each with its own bathroom. The apartment is decorated in homage to the maestro of fashion Cristobal Balenciaga Eizaguirre. A private indoor parking place is located 150 metres away. A newly refurbished apartment on the second floor for 4 people (5 at a squeeze) with two bedrooms, both with their own bathroom. There is a spacious, open plan lounge/kitchen/dining room tastefully decorated with traditional local themes, particularly drawing influence from the close-by Balenciaga museum. The kitchen is fully equipped with oven, hob, fridge-freezer, washing machine and dishwasher. 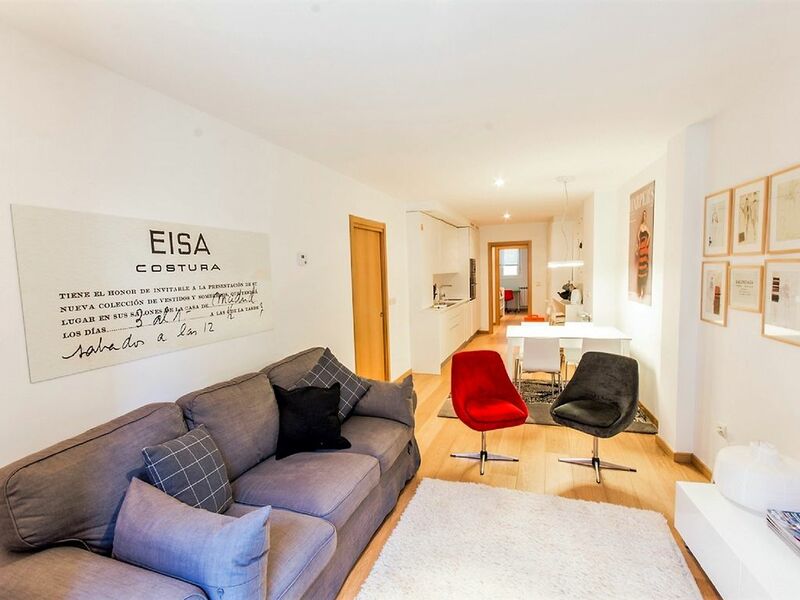 The apartment also benefits from lift access, a rarity in this traditional fishing village, and also has a garage parking place available some 200 metres from the apartment. We loved the apartment, the decoration, the comfort, the location and the vicinity to anything we needed while we stayed in the apartment for two weeks. The owners were great and responded very promptly if we had any questions. The only drawback is the noise on weekend nights if we left the windows open which we didn't. If I were to go back to Getaria I would certainly stay there again. Thank you Aberri and Amaia. Sehr schön und umfangreich eingerichtete Wohnung in der Altstadt Getaria. Die Einrichtung ist stylisch, sehr schönes Ambiente und umfangreich ausgestattet. Wir waren zu zweit in der für 4 Personen ausgelegten Wohnung. Für 4 Personen wäre die Wohnung etwas zu eng. Es ist eine Altstadtwohnung im zweiten Stock mit allen Vorzügen und Nachteilen: Aufgrund der engen Gassen ist die Wohnung insgesamt relativ dunkel und es ist bis spät in die Nacht sehr laut, insbesondere an den Wochenenden. Por un lado Amaia y Aberri son encantadoras, desde el primer momento todo son facilidades para todo. El trato y la amabilidad recibida hacen que te sientan como en familia. El apartamento es tal cual como aparece en el anuncio, ubicación inmejorable, calle peatonal con tiendas cafetería, farmacia y zona de pinchos, enfrente de la Oficina de Turismo y de la parada del Bus que te deja en 40 minutos en Donosti. Muchas gracias Eva y familia por vuestras amables palabras! Wunderschöne Wohung im Zentrum von Getaria. Wir haben hiet eine schön eingerichtete Wohnung bezogen, alles ist da! Sauber und komfortabel, wir haben uns richtig wohl gefühlt und 14 wundervolle Tage verbracht! Merci à vous pour être si aimable et gentil. Como estar en casa ! Tuvimos la precaución de visitar el apto unos meses antes de ir a pasar en él un par de semanas. No hubiese sido necesario. La descripción de los propietarios y las fotos de la web son un fiel reflejo de lo acogedor que es. Limpio, recogido, muy bien equipado y decorado con gusto. Lectura, revistas, películas, wifi ... y una cocina con fundamento. Ubicación céntrica y con todos los servicios en un radio de menos de 100m ( no es broma ). La atención de Amaia y Aberri excelente. Getaria enamora. Deseando volver pronto ! Culture, history and gastronomy feature large for local activities. Birthplace of Juan Sebastian Elkano, Getaria has an important place in history, and was also the birthplace of Cristóbal Balenciaga. The impressive museum dedicated to his masterpieces is definately worth a visit, as are any one of the splendid restaurants in the village featuring freshly caught and grilled fish. Visits to the vinyards are easily arranged, and for those that enjoy hillwalking with spectacular views, look no further. Easily accesible by car or bus is San Sebastian, with its beautifual beach and historic Old Quarter. Bustling Bilbao, with its famous Guggenheim museum and numerous other attractions, is less tan an hour away by car too. The picturesque villages of the French Basque Country are also within easy reach.